Cord Phelps, who played for the Amsterdam Mohawks in 2006, has been recalled by the Baltimore Orioles. 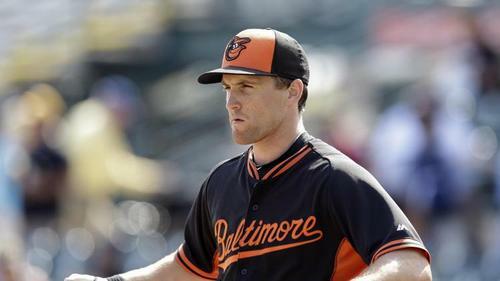 Phelps was recalled following a knee injury that forced Baltimore third baseman Manny Machado to the 15-day disabled list. Phelps played for an Amsterdam team that went 21-24 under coach Matt Mueller. Phelps hit .276 in 36 games and drove in a team-leading 24 runs. He drew 25 walks en route to a .395 on-base percentage while with the Mohawks. The Stanford, California native hit one home run and stole four bases. The infielder went to his hometown school, playing four seasons at Stanford. Arguably his best season came in his last in the red and white. In 2008, Phelps hit .351 with 13 home runs and 58 RBIs. His .351 trailed only current Houston Astros catcher Jason Castro for the team lead. Phelps did post the highest on-base percentage on the Cardinal at .445. Following the season, he was drafted in the third round by the Cleveland Indians. Phelps was summoned by the Indians for the first time in 2011. His first MLB hit came in his second big league game, a June 10 matchup against the New York Yankees. Phelps singled to right field in the fifth inning and later in the game drew a bases loaded walk to tally his first MLB RBI. His first MLB home run was a walk-off long ball against the Pittsburgh Pirates on June 19. Phelps was claimed off waivers by the Baltimore Orioles in November of 2013 and was sent to Triple-A Norfolk. Prior to his promotion, Phelps was hitting .258 in 97 games with a .358 on-base percentage. He had hit seven home runs and slugged 23 extra-base hits. He is a career .280 hitter in the minor leagues with a .368 on-base percentage and 60 home runs. The Orioles are set to face the New York Yankees tonight at 7:05 p.m. at Oriole Park at Camden Yards, You can follow along here. For more information on the PGCBL, visit www.pgcbl.com or follow the PGCBL on Twitter, @PGCBLbaseball.